XLV, XLV, hm. How does this work again? Subtract 32, divide by 9, multiply by … uh, wait, that’s not right. Oh, oh, I see. It’s 45. 45?! Geez, whodathunk. The theme this month, chosen by the boffins at Cocktail Virgin, is tea (tisanes included). Pip pip! With a month or so to go before Cook & Brown opens, I’ve been thinking a lot about the cocktail menu. So when I’m mixing drinks at home, I often have an eye out for drinks that might play well on the menu, both immediately upon opening and also months down the road. To reiterate, the remit at Cook & Brown will be to source our ingredients locally when possible and to cook (and mix) with a seasonal focus. So if I’m going to play with tea, it should be local tea. That in mind, I returned to a farmers market vendor I’ve mentioned here before, Farmacy Herbs. 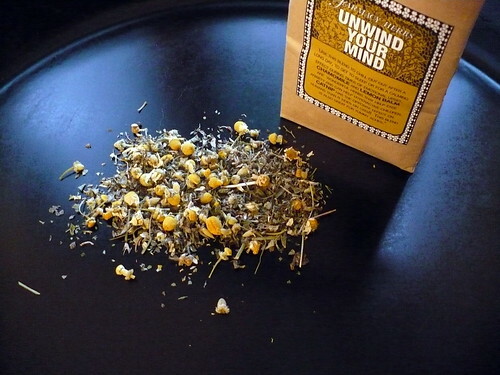 A couple of their teas had promise, but for my purposes I chose the Unwind Your Mind blend, of chamomile, catnip, and lemon balm. One purpose of a good cocktail is to relieve stress and banish the worries of the day, and I thought a relaxing tea might help. I figured I’d add a little local honey and because they’re available right now, Meyer lemons. I shook it and topped it off with a little Q Tonic to make a refreshing twist on the ol’ Gin and Tonic. Not seasonal to dead of winter, sure, but should be lovely in the hotter months. Gotta think ahead, y’know. For the actual C&B menu, I’ll probably use the tonic from a local soda brand, Yacht Club, instead of Q. And eventually, I’d like to play with a house-made tonic. Shake over ice, strain into ice-filled chimney glass. Top with tonic water. That sounds fantastic; do you mind if we put the recipe up on our website (of course attributing it to you)? Jordan, I would be honored. Thank you! Thank you for your MxMo submission! Looks tasty!